Samsung Electronics is inviting thirty lucky Samsung camera owners and selected professional photographers to embark on an unforgettable visual learning journey in Australia. Through the second instalment of its NX Traveller programme, Discover Australia, participants will be able to explore the stunning and diverse landscapes of Australia to capture the essence of its people, places, and produce through the Samsung lens. 30 lucky winners from Australia, Thailand, Taiwan, Singapore, Malaysia, the Philippines, and Indonesia will have the opportunity to participate in this pictorial journey. A total of three Filipino winners will be given the chance to join Tourism Australia and Samsung’s photography experts on one of two visually-stunning, all-expenses paid itineraries for five days from 24 – 30 June 2014. Professional photographers and enthusiasts alike will have the chance to capture breathtaking landscapes and cityscapes in two of Australia’s most renowned cities – Melbourne and Sydney. From Sydney Harbour to Great Ocean Road, the journey promises to be one that will offer unparalleled experiences in photography. During the journey, Samsung will provide participants with its latest NX30 camera to enable them to experience first-hand the camera’s professional features, including the advanced 20.3MP APS-C CMOS sensor that ensures brilliant images even in low lit situations, the next-gen hybrid autofocus system that provides accurate focusing, and a 1/8000 second shutter speed enables users to capture fast-moving subjects with little to no blur. Embedded with NFC and WiFi capabilities, the NX30’s Tag & Go feature also enable users to quickly send their pictures from the camera to their smartphones or tablets by simply touching the camera to the device, making seamless sharing simple and easy. Celebrity photographers will also be onsite to provide guidance and tips and tricks to help bring participants’ photography skills to the next level. This thrilling photo-journey contest is open to all Filipino residents above the age of 18, who are Samsung camera owners or experienced photographers with existing portfolios but do not necessarily own Samsung cameras. Interested participants simply have to register online. For Samsung Camera owners, tell us why you want to win a trip to Australia. Please note that one entry per unique Samsung camera serial number. Winners will be chosen via raffle. For experienced photographers, simply submit a link to your online portfolio for us to judge and review. 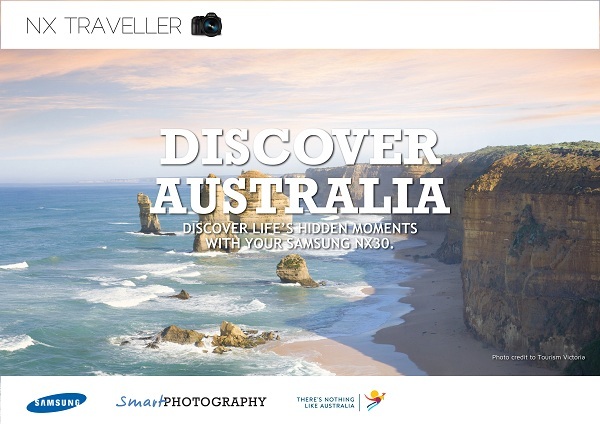 To join, participants can visit the Samsung Smart Photography Portal (https://www.smartphotography.asia/nxtraveller). All entries should be submitted through the Samsung Smart Photography Portal by May 25, 2014. This will be the last week till your shot at Discovering Australia. Hurry and join now!